Have you seen the photo up above floating around your Twitter or Facebook feeds? And yes, you do burn calories climbing and descending staircases. 0.17 calories per stair climbed, and 0.05 calories per stair descended, according to one source I found. Given there are 12 steps in the average flight of stairs, heading up and then back down would burn you somewhere between 2.5 and 5 calories. So for instance, if you wanted to climb the stairs enough to burn the calories of a Snickers bar, you'd need to climb 122 or so flights. The message that calories can be burned through stair climbing (or parking in the furthest spot, or getting off the bus one stop sooner, etc.) in quantities enough to be exciting is problematic in that it reinforces the erroneous notion exercise burns boatloads of calories which in turn might lead a person to more readily believe that taking stairs burns enough calories to justify treats or portion sizes they'd otherwise not consider. It also runs the risk of a newly motivated person deciding to stop taking the stairs and parking further away when their weight inevitably doesn't change as a consequence. 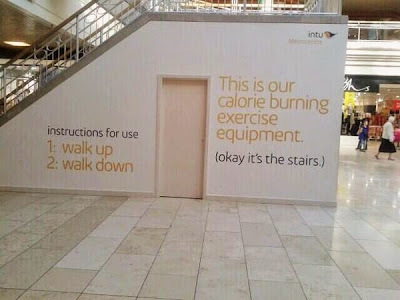 And stopping taking the stairs would be a shame given that when it comes to health, exercise is the world's best drug - it's just not a weight loss drug - and tying stair climbing (or any exercise) to calorie burning rather than health, misinforms the public about both.